A second half fight back saw Clonard finish five point winners over Ballinlough, in an entertaining Junior D Championship fixture played in Athboy on Thursday evening. Clonard started the contest the brighter of the two sides, opening up a two point lead before James O’ Higgins got the ‘Loughs first score with a well struck free off the ground. Ballinlough were soon in front, after Jack Tunney found the back of the net following a precise pass by Johnny Reilly. Clonard however responded in kind, and raised the green flag after a flowing team move left the Ballinlough defence for dead. The Reds’ veteran forward Ken Rothwell was beginning to have more of an influence on the game as the half wore on, and it was great work by him around the middle of the field, that set Johnny Reilly up for his sides next score. James O’ Higgins was also in great form and added a further four points to his tally before the change of ends, including a further two expertly converted frees. Ballinlough’s player/manager Tom Shine closed the half with two fine points, after good work around the middle of the park by Nicolas Finlay, to leave his side leading by 1-07 to 1-05. The balmy conditions of the first half were replaced by torrential rain in the second half. 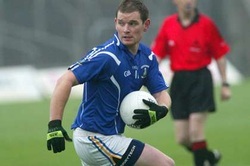 And with the change in weather, so came a change in momentum as Clonard launched an impressive fightback. This was largely aided by the halftime introduction of David Rowley, who immediately announced his arrival with a point. Reilly and O’Higgins converted scores for the ‘Lough, but Clonards confidence continued to grow as they hit five unanswered scores. Even being reduced to fourteen men midway through the half did not stop their stride as they opened up a 1-13 to 1-09 advantage. With five minutes remaining, Shine pulled a goal back for Ballinlough, leaving the bare minimum between the sides. However, Rowley showed great leadership for Clonard and bagged a further 1-01 for his side before the end, to see them claim a deserved victory. Best for Ballinlough on the day were James O’ Higgins, Ken Rothwell and Shane Smith. Ballinlough: L. Gibney, M. Farrell, E. Smith, S. Smith, P. Farrelly, J. O’Reilly, O. Brady, K. Beirne, N. Finlay, J. O’Higgins, K. Rothwell, D. Lynch, T. Shine, J. Reilly, J. Tunney. Subs: M. Reilly for D. Lynch, D. Farrelly for P. Farrelly.